Who Would Buy This: Those shopping for a contemporary round glass top dining table. The Panton Round Glass Top Dining Table is a prime example of a design that creates a real impact via its simplicity. Truly great designers know when to stop; when that extra flourish will detract from the beauty of their finished item. In this regard, the designer was “right on the money”, so to speak in creating a design that will be considered contemporary for many years to come. 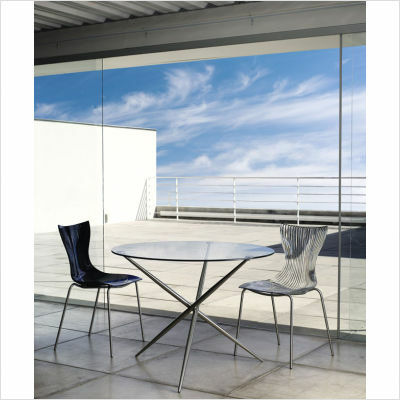 The criss cross of the metal legs with the glass top is impressive without being overpowering. This round dining table is available in other materials including dark ebony and teaka finishes, but I have to admit that this configuration is my favorite. The Panton Round Glass Top Dining Table is available in three sizes – the 31″ and 39″ diameter tables will seat 4 guests comfortably while the 47″ diameter table will seat up to six guests. The selection of sizes allows you to make a choice to suit the space you have available. This dining table is constructed using only environmentally sustainable materials and so it is an eco friendly furniture choice. There is some assembly required but it is certainly nothing too demanding. If this table is ordered from All Modern they include White Glove Platinum delivery (at time of writing) which includes some assembly time. Given the caliber of the design and the quality of the product, I would give this a definite yes on value for money. If you love this table but it is outside your budget you might consider the Axis Round Glass Dining Table as an alternative.